Before completing this form, see the Frequently Asked Questions below. Explore the content below to learn more about MUM and our international programs. Can’t find your question? Send us a message using the form at the top of this page or call our office at +1 (641) 472-1110 to speak with an admissions counselor. We are located in Fairfield, Iowa, a five-hour drive from Chicago, Illinois. Is MUM an accredited university? Maharishi University of Management is a federally-recognized 501(C)3 non-profit university and is accredited by the Higher Learning Commission (HLC), an accreditation agency recognized by the U.S. Department of Education. 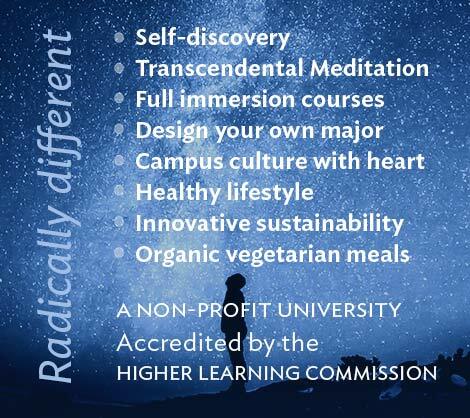 We offer degrees in arts, sciences, and humanities, ranging from business administration, creative writing, sustainability, computer science, integrative medicine, and more. See our Degree Programs for a complete list of programs available at MUM. Can you tell me more about your MS in Computer Science program? Our MS in Computer Science program (ComPro) emphasizes modern software development including distributed, parallel, and web computing. A popular program, it attracts computer science professionals from all over the world, most of whom go on to enjoy successful careers with major companies worldwide. For information on this program, including entry requirements, structure, financial aid and loans, and how to apply, see the Computer Professionals Program website. Visit MUM Online to learn more about our online bachelor’s and master’s degree programs, as well as individual courses. For a comprehensive list of entrance requirements to our bachelors, graduate, and Ph.D programs, visit the international admissions requirements page. We do not offer full scholarships at this time, but provide generous financial aid to international applicants. For estimates, visit our Cost & Aid Calculator. Select “I am an international student” and your program of interest from the list. You will view a summary of tuition and fees, financial aid available, and the amount you pay out of pocket. Go to our online application form. A $20 fee applies, which you can pay with a credit card upon submitting the form. Be sure to read the International Students overview before you apply to learn about the admissions process, application deadlines and program start dates. 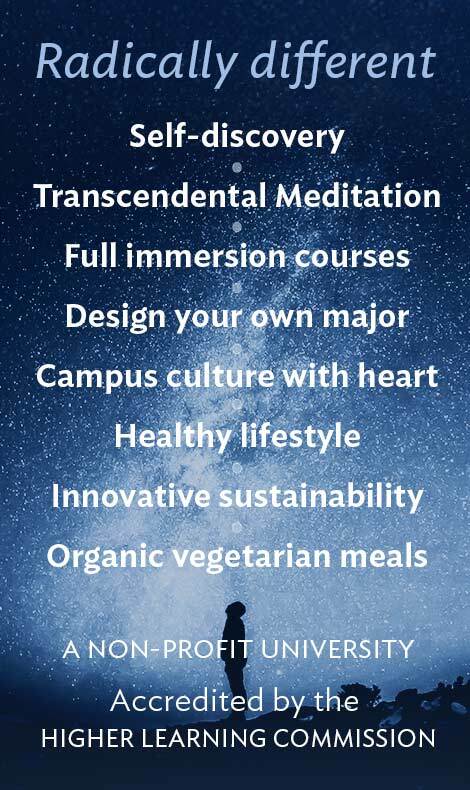 The Transcendental Meditation® (TM®) technique is a key component of our Consciousness-Based educational approach. It was brought to the West in 1958 by the founder of our university, Maharishi Mahesh Yogi, to develop the inner potential of everyone. Our students and faculty practice it for 20 minutes twice daily while sitting comfortably with eyes closed. Visit the worldwide Transcendental Meditation website directory to learn more about this evidence-based technique. Can I transfer to MUM from another university? Yes. Please contact our International Admissions office before applying to discuss your transfer eligibility. What on-campus housing options do you offer? Unlike most American colleges, our students get to enjoy their own space – single rooms are standard at MUM! We offer separate dormitories for men and women, as well as gender-inclusive housing. Family housing, however, is not available at this time. Your counselor can provide you a list of off-campus housing resources upon acceptance to MUM. What type of food is served on campus? Our dining hall provides organic vegetarian meals daily at breakfast, lunch, and dinner (brunch and dinner only on Sundays). All on-campus students are required to pay for a full meal plan. Does the University provide health insurance? Yes – in fact, we require international students to carry health insurance throughout their studies. All international students are enrolled in our university plan upon registration unless acceptable proof of insurance is provided. Insurance fees are added to your tuition charges. Yes. We recommend, however, waiting a few months to give yourself time to settle into your academic program and find adequate housing for your family. Students who’ve followed this advice found it made their dependents’ transition to the US much easier. Your admissions counselor will indicate the documents needed to issue dependent I-20s for your family.